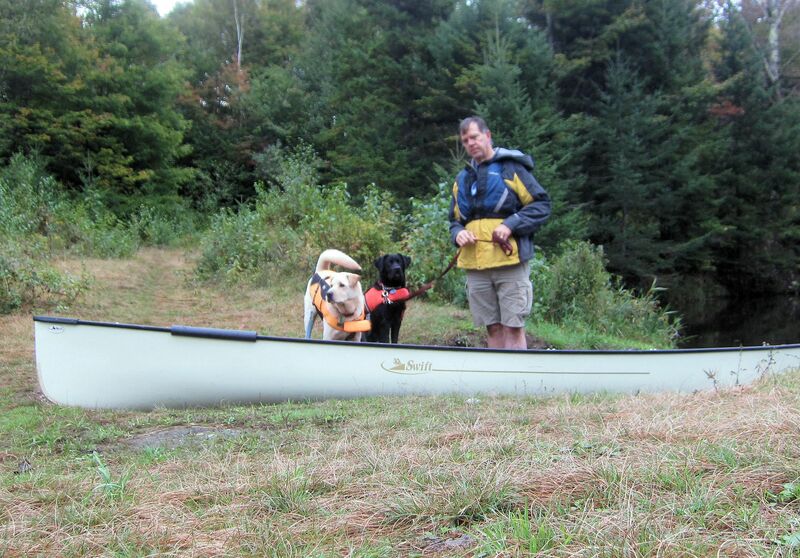 Early Fall Camping…Cool , Grey, and Very Peaceful | Vermont Paddle Pups! Out we went, skies heavily overcast, and light rain in the air. That’s not about to stop us..and the forecast was for clearing skis overnight, and a sunny next day. 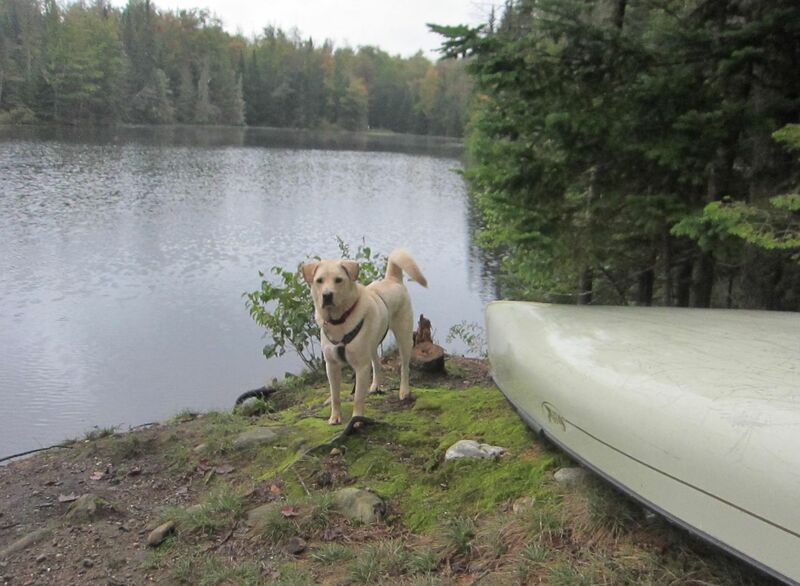 Well, we never did see the sun, but the rain never interfered with our activities, and the new boat was wonderful! The loaded boat handled very well; nice and stable, even as we paddled nearly 2 miles in choppy water. I tried to ignore the small whitecaps, and focus on our destination…one of the campsites farthest from the ranger station. We found it, in a protected area, where winds were calm, and the birds were active. 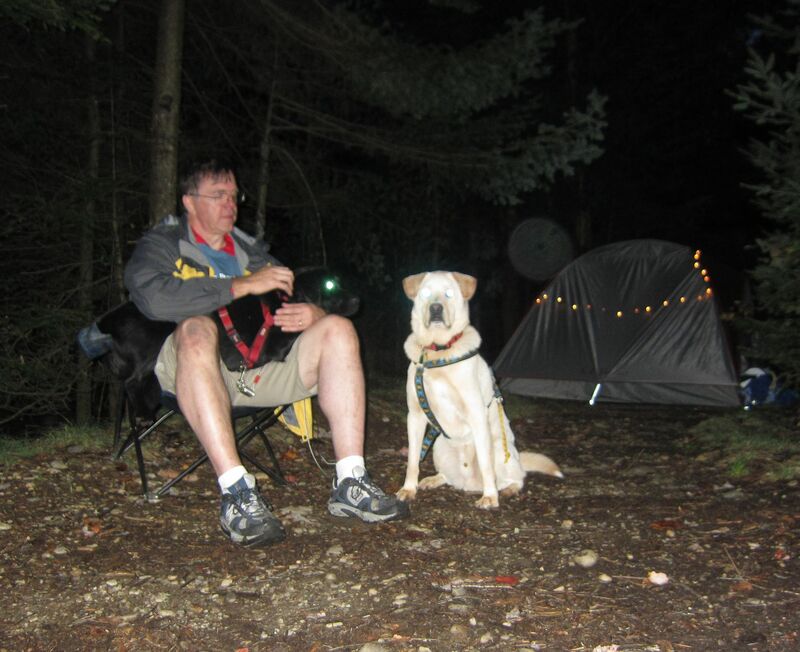 The campsite has a rather precarious take-out area, but we managed fine, and the dogs quickly ran up the trail to the tent site. We utilized a new large dry sack for 4 sleeping bags and other soft gear. However, we failed to adequately “keep our powder dry”,and our fire making materials got a bit damp. At least we did not need a fire for cooking; our trusty Jet Boil, and some Mountain House fajitas , provided us with a warm repast. The dogs were anxious to hit the sack, so we turned in early…during the night, the wind began to get quite blustery, bringing in some more showers. Thankfully, the temperature never dipped below 45f. The dogs were up an raring to go at 6:15, so after breakfast, we headed out to explore Heron Bay. This portion of the reservoir is off limits until August, as it is a breeding area for herons and other birds. There is a very short portage to get into the bay ( a short kayaker could probably get under the bridge that separates the bay from the rest of the water), so we got more practice landing the new boat. In the bay, we followed the serpentine channel that was NOT covered in lillies and weeds. There is a man-made heron nest, and heron-made nests in this area. I did see one large Great Blue Heron come in for a landing in some marshes. The morning was grey, but that highlighted the fact that bursts of fall color are starting to show up on the banks and hillsides. Our next scheduled overnight is at the height of foliage..rain, please stay away! After our trip to the bay, we returned to the campsite, and packed up for the hour long paddle back to the ranger station area. Once again, the loons were following us, and a heron flew right in front of us, on his way to a smooth landing on an island. The chorus line of Canada Geese stood on a rocky island, voicing their displeasure at our passing. 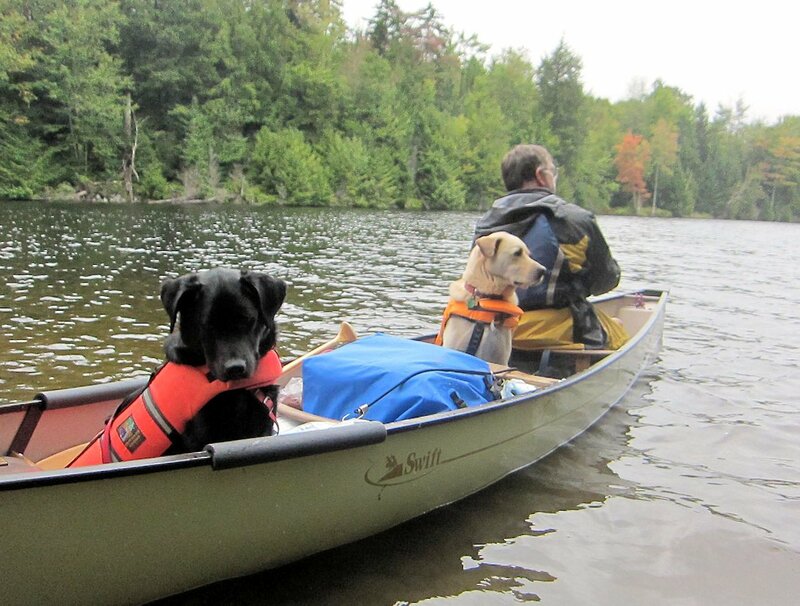 We disembarked, just as the wind and currents were noticeably more present; a nice kayaker and his wife assisted us at the shore, stabilizing the boat as the dogs leaped out. After loading up the gear, and securing the canoe on the roof, we headed home…a short stop an an unnamed fast food restaurant for hot coffee finished off the trip. 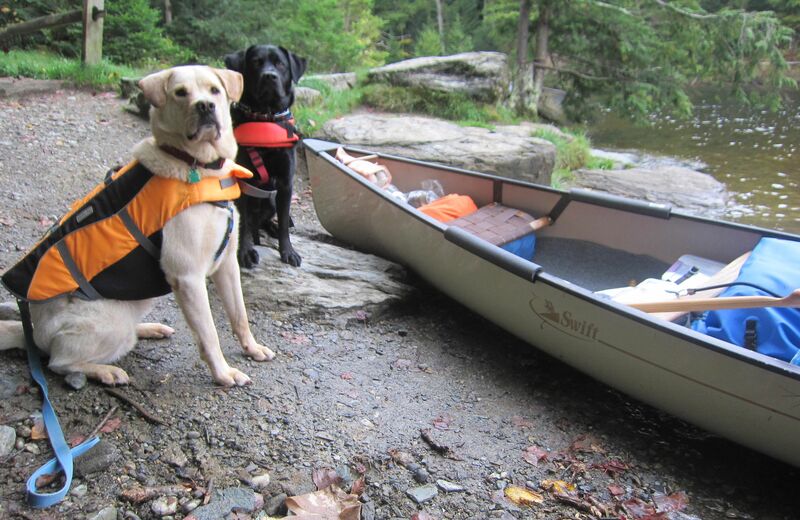 And no…we did not make the fatal flaw of driving through the drive-thru, with our top loaded canoe! 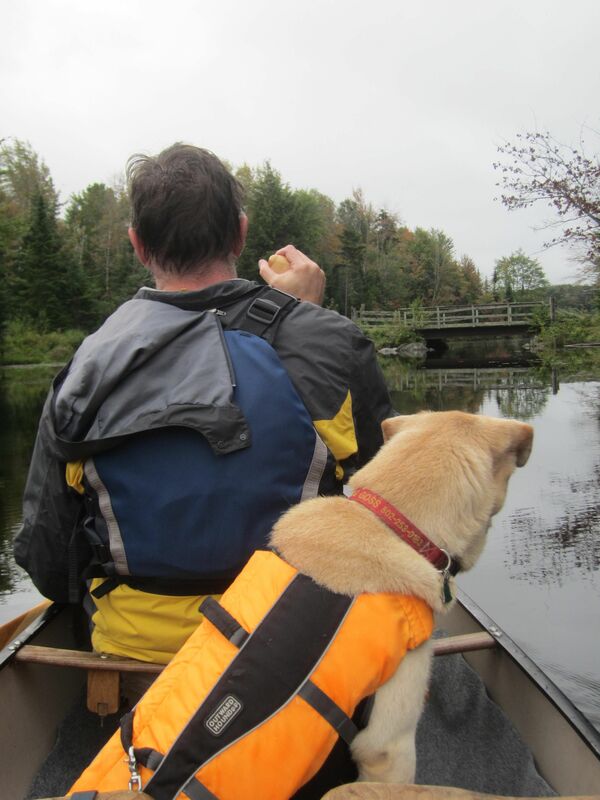 ← Birdwatching from the canoe….